San Francisco is one step closer to finalizing the redesign of its public, self-cleaning toilets. On Monday, the city selected a futuristic design concept created by SmithGroupJJR from a trio proposals that included bids by Min Design and Branch Creative. The three finalists were unveiled in April, with SmithGroupJJR ultimately selected in an effort to boost the contemporary stylings of the city’s public facilities, according to the San Francisco Department of Public Works. Initially, 12 teams were in the running for the design competition. The public toilets will operated by bus stop advertising agency JCDecaux and will be funded via income generated from informational and retail kiosks that will be deployed in conjunction with the toilets. 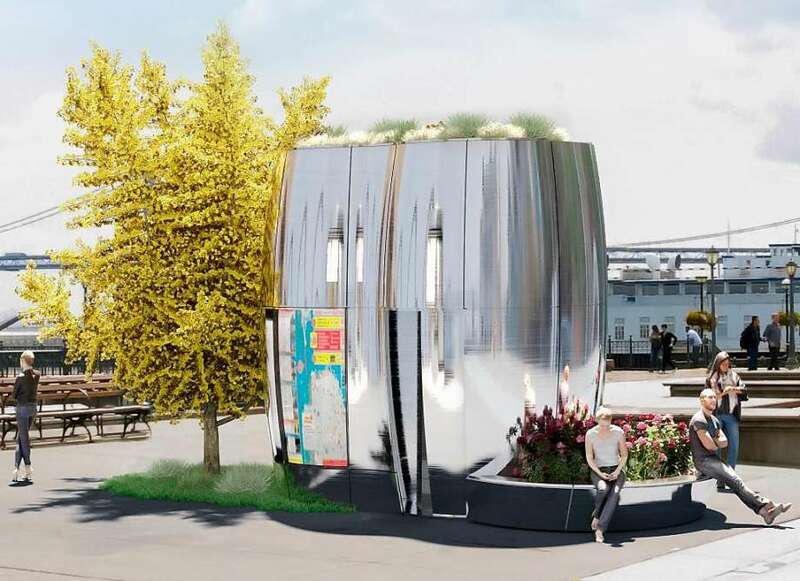 The changes come more than 20 years after San Francisco debuted an initial, Art Nouveaux-inspired public toilet concept in 1996 that has been loved and hated alike by the public. The forest green-colored, pill-shaped facilities are currently dispersed throughout San Francisco’s urban core and are also used in Los Angeles, among other localities. In all, the city aims to install or replace 28 public toilets and 114 kiosks in conjunction with the redesign. The proposed bathroom facilities will make use of recycled water and are wrapped in reflective metal panels. Current plans call for topping the structures with a rooftop garden. Renderings for the concept include an integrated bench assembly and a ground-level planter, as well. The new proposals, however, are not uniformly loved, either. Darcy Brown, executive director of the San Francisco Beautiful group, told The Chronicle, [It’s a] “pity we lean toward ‘modern,’ which has a shelf life, as opposed to classic, which is timeless.” San Francisco Beautiful opposed all three of the redesign concepts. Next, SmithGroupJJR’s proposal will next head to the San Francisco Arts Commission and the Historic Preservation Commission for joint approval. Approval is expected in the fall.